As Spock might have said to Kirk in his final moments (had they been at Comic Con rather than in the radiation saturated engine room of the Enterprise) “I have been, and always shall be, a fan of The Avengers”. How could he not be? Driven as he is, and was, by logic, probability suggests that he would have to be a fan of the book. After all, Marvel’s premier all action squad of heroes has been one of their most consistent titles since it was first published and while there have been moments when it’s floundered, they have, thankfully, been few and far between. Meaning that logically, Spock would have been drawn to The Avengers with the same fevered curiosity and joy as an Astrophysicist is to the Drake Equation. The members of the team may change, but its core values and mission remains the same as it has always done: to protect the Earth and everyone, and everything, on it from the dangers and threats that no-one else can. That’s probably why the book has always attracted the best writers and artists and has been able to maintain its exemplary level of quality since its inception. 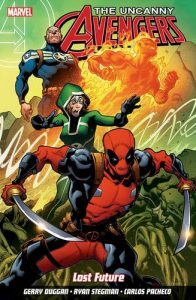 With Gerry Duggan and Ryan Stegman now assuming those duties on Uncanny Avengers Unity, you know before you’ve even read the first panel on the first page that this book is not only going to carry on that rock solid legacy, but it would also garner the Spock seal of approval. And yes, Spock reads comics. He loves science, he’s a forward thinking, intelligent, sensitive guy who isn’t fazed by fashion and enjoys the odd game of chess and problem solving. He’s one of us.